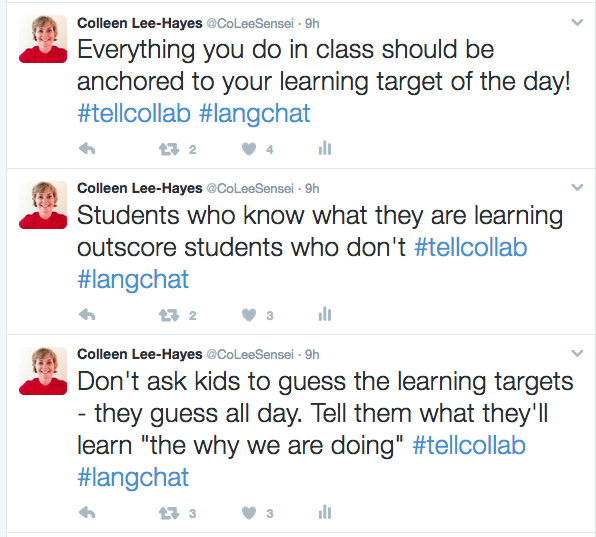 TellCollab Day 2 – Know Your Goals & “Fail Forward” As You Model Learning! 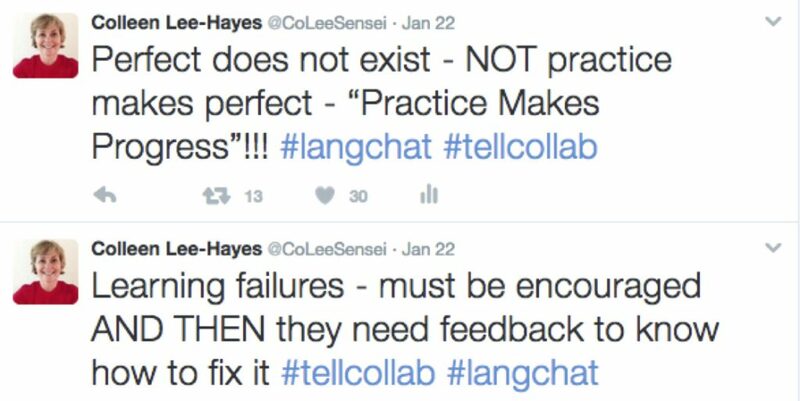 “Fail Forward” and “Practice Makes Progress” – Alyssa reminds us that we spend too much time telling kids what they didn’t do correctly and not enough celebrating their risk in trying something new. Too much is spent on ‘marking what isn’t right’. Where is the acknowledgement of growth – of improvement? Kids, she says, are not afraid of something that is “hard” – just look at all the time they spend on video games! What they want to know is that they can risk and try in a ‘safe’ environment…And why are we questing for perfect? If it is ‘perfect’ then they are not trying, growing and risking. I love this and it is my new mantra for my classes. I always ask them “do you know more than you did yesterday? Are you growing?” Validation that this is a way to go! 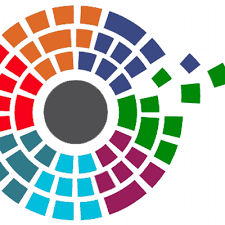 Students Need To Know What Their Target Is For Class and For Proficiency – this was also a focus of Thomas Sauer‘s session from Day 1 and it really hit home. There should not be any mystery or guessing as to why students are doing something in class. They should know what the daily goal is. They should also know what the target – proficiency – is for them in the course. They want to know how to be successful. Going back to the video game – they know what level they will achieve if they are successful. That’s why they are playing that game over and over trying to get better. Why am I not spelling out the goal. I do set out my expectations but what I have not done is linked that to what the ‘level’ of achievement will be. 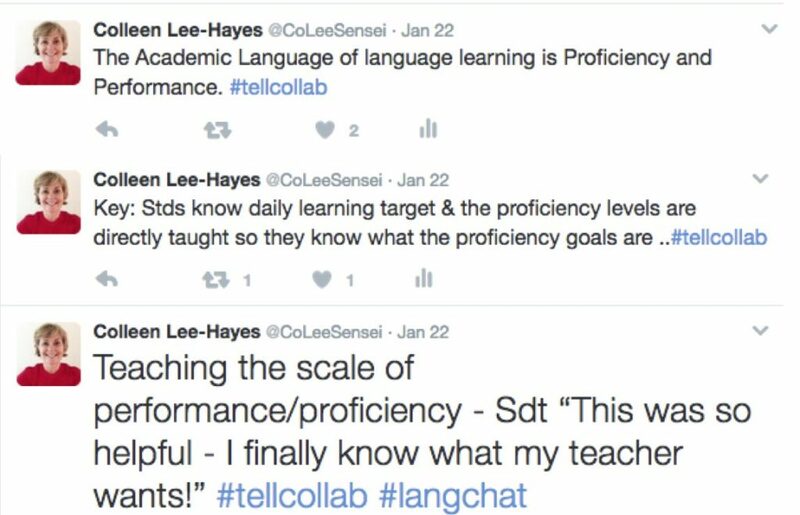 Truth be told I’ve never really seen the big deal of telling kids about ‘proficiency’ and what level they are. “Whoop de doo..novice” I thought. But now I am seeing it. The power in the hands of the student to see levels of proficiency in meeting the ‘goals’ not just the expectations for class. I’ve had the expectation but not the explicit goal that they are trying to attain. My goal was just what I expected them to do…not something concrete they could work on to ‘achieve’. I’m going to work to implement them in my classes – even just starting next year with my incoming students (a gradual implementation for sanity!). Model and Check More! – I like to think that I have modeled enough – but I realized that this includes all that incidental language I use. “Where is my pen?” and why am I not muttering out loud in the TL. I will be now! Alyssa also made a powerful statement that if we model, we use the TL and then switch to English we do nothing for out students. That the minute a student knows that the teacher will move to English they just begin to ‘wait them out’ until they do. 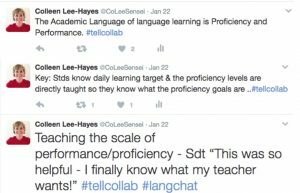 If we are going to model language use then we model it! This doesn’t mean 90% TL necessarily (no guilt please!) but it DOES mean that we are consistent (to me) in how we use the language in class. And once I model, I need to check more with students before the ‘practice with your partner’ part. More feedback from them – even non-verbally – that they are getting it before I ask them to use it….Duly noted. And my final takeaway – I need an honest look at what/how I am operating in the classroom. I need to invite an administrator in, ask a colleague to observe or (gasp) get my students to give feedback on how I am doing in my goals for my classroom. Because if I am truly going to ask for risk-taking, fail-forward, goal-focused students then I better be that kind of teacher too. 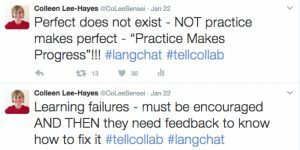 TellCollab Seattle Day 1 – I’m On The Right Path With Lots of Stuff to Learn! I have journeyed to Seattle – a country away (okay a 2 1/2 hour drive)- to participate in the 2-day TellCollab workshop presented by the TELL Project. Excitement & trepidation all at once. Am I okay with what I do? What am I doing that others are doing? Am I on the same page as others? What are their concerns, hopes, frustrations? Are they like mine? Day 1 began with a ‘meet’ of everyone attending (so glad to see fellow #langchat-er Catherine Ousselin & meet (in person!) Alyssa Villarreal) – who we are (name/language/where from) and what – in 3 words – we think effectiveness looks like in a language teacher. Three words – that’s it – Thomas Sauer knows his audience (we are language teachers – we like to and can talk!) and in confining us to 3 words we each get down to the essence of what we think ‘effective’ is. For me it is “Confident reflective communicators”. It’s amazing to hear what everyone thinks and most of what they say I think “I could have said that”. After some background on the Tell Project we are asked to look at a lesson and rate it for effectiveness. We look, listen and each silently rate. We report out and – not surprisingly – we have graded it from a 2/5 to a 5/5. 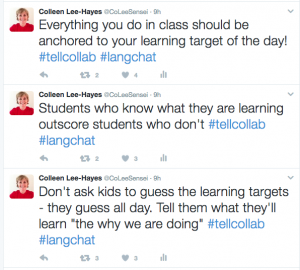 Imagine – we are a group of ‘motivated’ teachers (we’re there at TellCollab aren’t we?) and we can’t agree on what effective is. I’m sensing though that I am not going to be “told” an answer….that I will have to find and develop an answer for myself (am I right?). Our only ‘led’ session of the day for me is about looking at objectives. I learn that I am clear on my ‘performance objectives’ for the end of the unit , even what the performance indicators will be to assess but whoa …I’m not so consistent or great at each lesson objective. Three big ‘revelations’ for me: We then look at the ‘wording’ of those “I can…” statements. Oh I’m all about writing those. I can write them well I think…but maybe not…I see now that I will be revising many of them. Why? They are either not ‘function’ oriented – ‘say’ and ‘write’ are not functions or they are not student friendly (Who actually uses the word ‘hobby’ these days asks Thomas!) We look at a series of “I Can” and I’m getting a feel for how I can make them more ‘effective’ and meaningful (another post on this to come!). Our breakout sessions are determined by our ‘post-it’ notes about what we want to learn. We are also encouraged to take charge of our learning. If a session isn’t hitting what we need we are to use our two feet to take us to one that is. This does not, surprisingly lead to people leaving from sessions willy-nilly. But it does allow us to change tables to really get to something we want to know if we want to – I like having that permission. I wanted to look at my own target language use in class. It’s something I don’t think I do well. Secretly, as someone who is not a native speaker, its something that I fear; that I don’t always think I CAN do well. I either run into something that I want to say that I am not sure of, or (yes) can’t, or I ‘give’ too easily and revert to English in instructions. I met teachers who hard-core refused to use any English. I met another who gave me hope – who talked about “how” she stayed in the TL even if her beginners asked questions in English. I learned that I am going to need to think my lessons through more closely for the language that I will need to use to instruct in. I realized that I can make use of my love of visuals in helping to facilitate staying in the TL. I have admitted my personal fear to myself (of not being ‘good enough’ in the TL) & through listening & learning have started to commit to ‘do more’ and have some ideas ‘how’ to get this done. I am on the way but not there yet – and that’s okay – I’m on the ‘road’…. What a feeling of empowerment and validation to be in a room with a group questing to be more effective but not thinking in any way that they have the exclusive answer on ‘how’ to be. End of day 1……! Looking forward to Day 2!! !